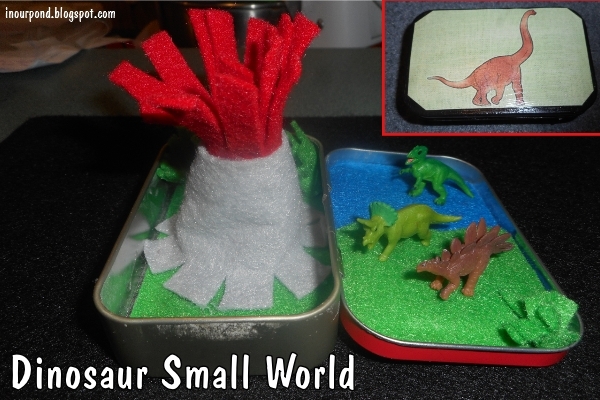 This dinosaur small world is probably the best of all the tins I have made. The volcano is hollow, so the dinosaurs can fall into it. At the end of playtime, the volcano folds up into the tin for storage. The mini dinosaurs come from a "Good Luck Minis" pack by Safari Ltd (we love Safari!). The felt is all pieced together randomly. I'm hoping the kids enjoy it. I think it might be Dragonfly's favorite. She's really into dinosaurs right now and only has one item on her "what I want to do in the car" list- small, squishy animals. These dinosaurs will be a surprise, but are exactly what she wants. 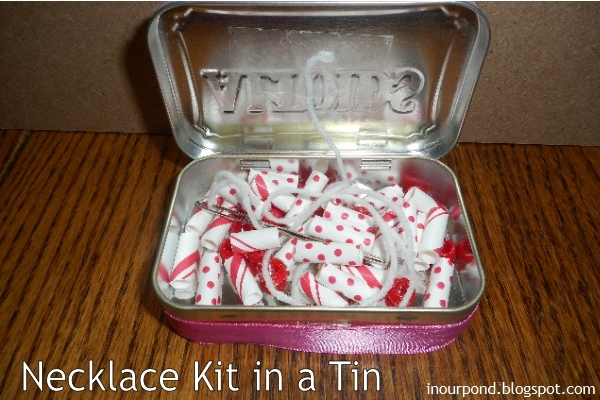 I always carry around an Altoid tin of bandaids in my purse, but now I have a fancy cover for it. The printable can be found at the Far From Normal blog. 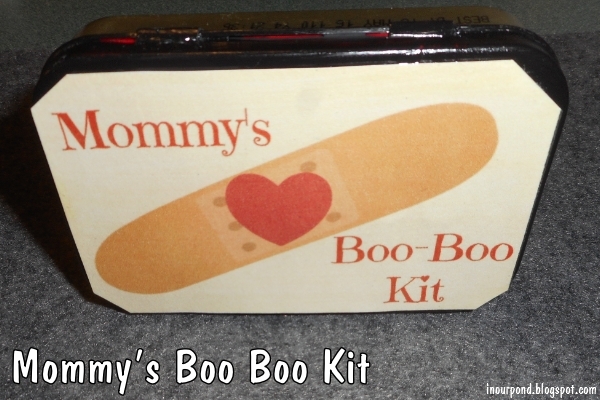 Besides bandaids, I also like to include a pair of nail clippers and a pair of tweezers- just in case. 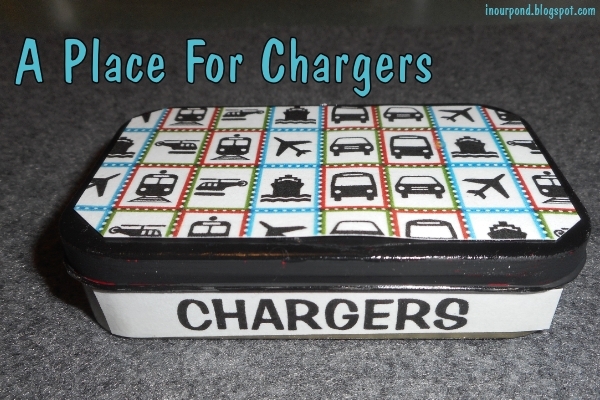 I bought the 4-USB lighter charger from Amazon recently, so I'm going to use this box to keep some of our USB chargers in the car. I figure that any containment is better than having the cords lose, but I'll have to see if this actually works for us. This box is at the request of Dragonfly. She's always asking me for a "hair tie" to hold the braids she makes in the car. I also included some of my own hair ties and a few bobby pins. 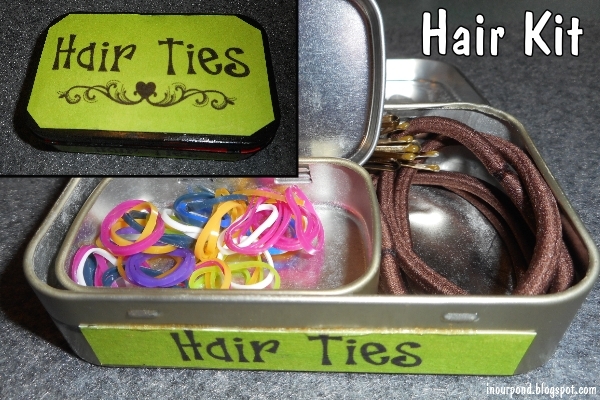 The small Altoid tin and the bobby pins are held by extra strong magnets. 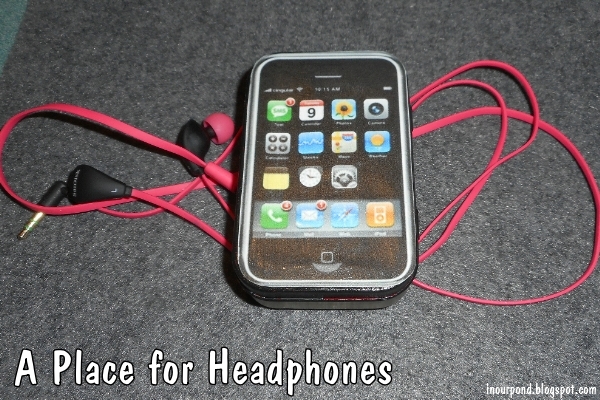 I only use my headphones in the car (when I'm not the driver), so I thought I'd start storing them in the car. 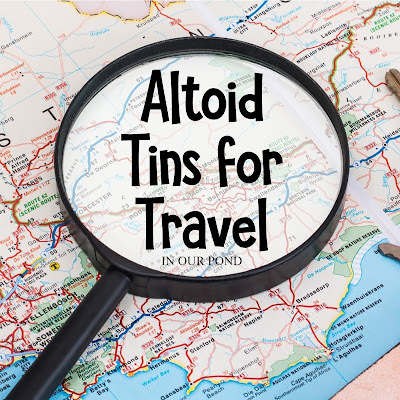 This Altoid tin will hold the ear buds and keep them from getting tangled around other things. 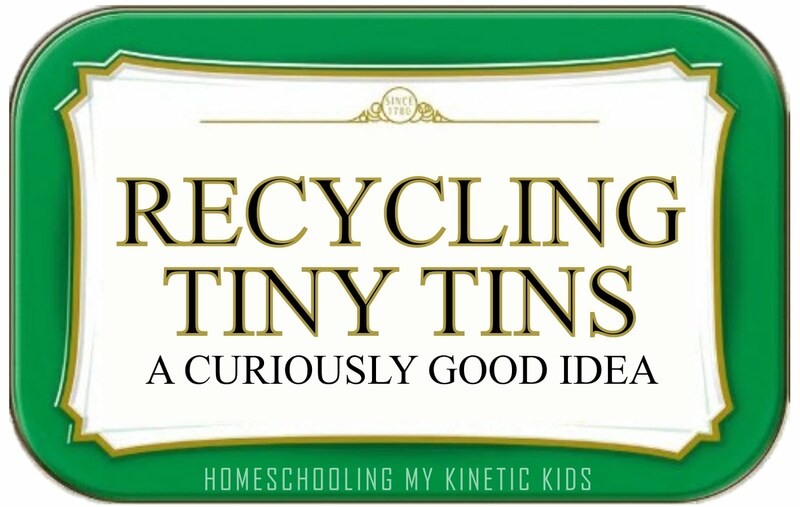 The cover for this tin comes from neatorama.com. This tin is just for me! 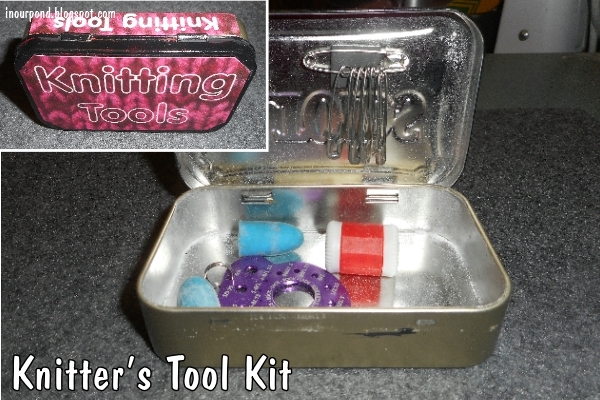 I like to knit in the car, and this tin holds all my knitting tools. I still need to add some stitch markers (although, of course, I could use the mini hair ties from the other box) and a cable needle. I'm really excited to have this available to me in the car. I haven't finished this one yet, but I thought I'd post it on the end of this post, so I don't forget about it. 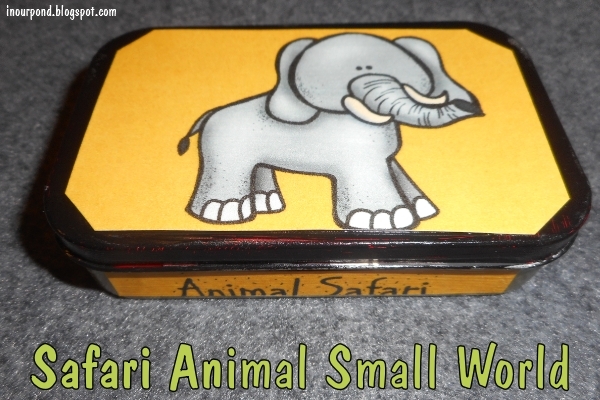 This tin will have a felt landscape and "tiny, squishy" safari animals in it. I had made this one for last year's road trip. The needle is tied to the yarn and the end of the yarn is taped to the tin. The beads are cut up paper straws and pony beads. I hope you were inspired by these idea. Please comment with your favorite uses for Altoid tins in the comments. 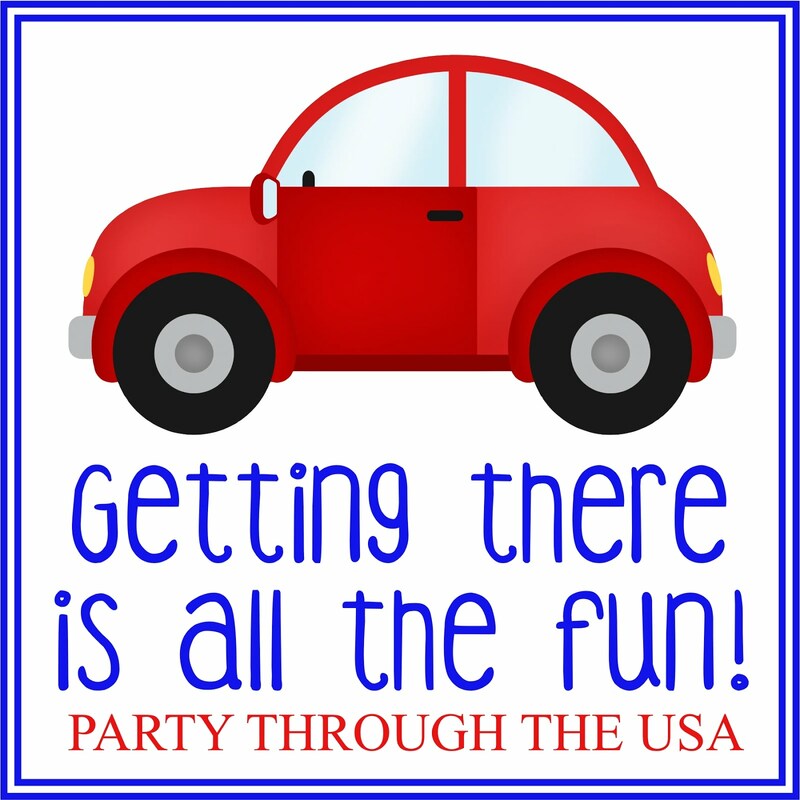 Come back again next Tuesday for another Travel Time Tuesday!